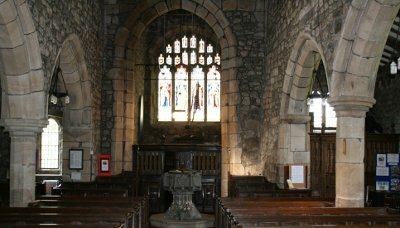 There has been a church in Bolton-by-Bowland as early as 1190 but little is known of it. Parts of the current church date from the 13th century. In the middle of the 15th century Sir Ralph Pudsay , Lord of the Manor of Bolton, began rebuilding the church which was completed about 1466. 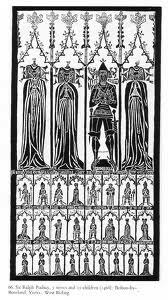 An unusual feature is the Pudsey tomb, depicting Sir Ralph, who died in 1468, his three wives and 25 children. The tower of the church is said to have been designed by King Henry VI, who was sheltered by Sir Ralph in 1464. If you stand by the front and look up the nave you see a building that in its overall plan and structure is late medieval. In the middle of the 15th century Sir Ralph Pudsay, lord of the manor of Bolton, began the rebuilding. He first enlarged the nave and probably lengthened the chancel: then the tower was constructed. This work was completed by about 1466 or 67. 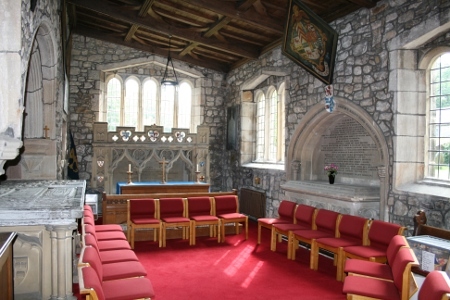 Later the cancel was further extended and, last of all, his grandson, Henry Pudsay, built the chapel to the south of the chancel early in the 16th century. 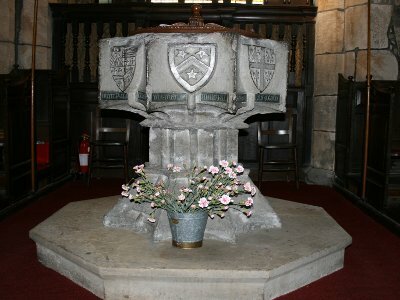 The font - the font was made in the 16th century and, in the years since then has been knocked about a bit, probably mostly by the Puritans in the middle of the 17th century. The eight shields round the bowl are those of the families connected with the Pudsays or of importance in the district. 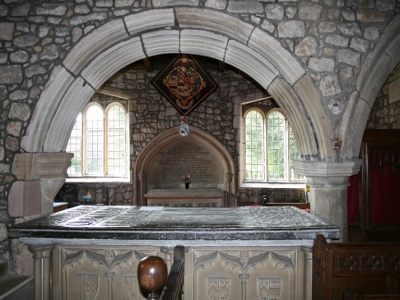 The Pudsay shield itself is one on the east side, facing up the nave. Originally these shields were coloured according to their proper heraldic colours. A small brass fillet on four sides of the bowl has a Latin inscription asking your prayers for the souls of Sir Ralph Pudsay, Lady Edwina his wife, and William their son, Rector of the Church. Font oak cover - the oak cover to the font was carved at Robert Thompson's workshop at Kilburn, Yorkshire in 1967 and has his "mouse" trademark on it. The nave furniture - is the late 17th century, that in the chancel late 19th. The priests stall and choir stalls, together with the lectern and pulpit were made 1886. 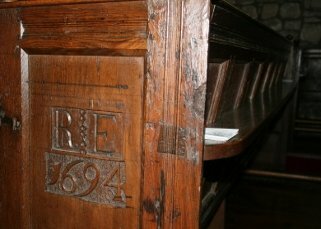 Pews - As you walk up the nave you will notice that many of the pews have the date 1694 and the carved initials of their original owner. One has the name of his house as well-Aldres-Alder House. The pulpit - contains two earlier panels which have been described as "Flemish Baroque". One represents the Annunciation, the other the nativity. On the wall behind the pulpit is an old oak board with the date 1703 and Latin inscription "woe is me if I preach not the gospel". This is part of a former three-decker pulpit - probably the back piece behind the preacher. Above the board can be discerned a made-up doorway. 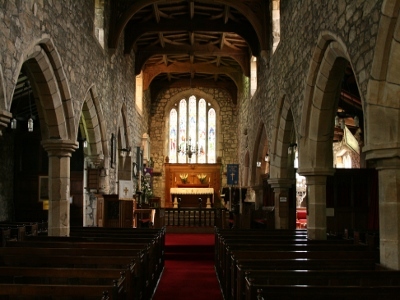 This was the entrance, from a staircase on the other side, to the road-loft over the chancel screen. The rood loft was dismantled at the reformation, the screen some time early in the 19th century. The communion rails - have the date 1704, and were installed a year after the stone alter was re-erected in it's former place. They were lowered in the 19th century and were moved to their present position in 2000 to aid people coming to communion. 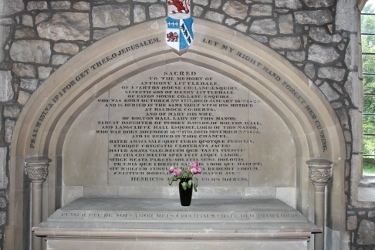 The Pudsay Tomb - On the south side of the chancel under a semi- circular arch is the Pudsay Tomb a memorial to Sir Ralph Pudsay who restored the church and died in 1468. He is shown with his three wives and 25 children. He did not, of course, have three wives all at once nor did all his children survive infancy.Sir Ralph's son, William, Rector of the church at the Restoration, is shown dressed in a cassock and cape in the top row, third right. The Pudsay Chapel - this was built in the early 16th century, the walls now house various memorials to the Pudsays, together with the Dawsons and Littledales who followed them. An interesting memorial is an 18th century brass, one of three together in the southwest corner. This is to Bridget Pudsay and her nephew, Christopher Dawson, who were joint owners of Bolton Hall for 42 years. Bridget died in 1771 and was the last of the Pudsays, Lords of the Manor since 1349. Hatchments - the four painted boards high on the Walls are hatchments - armorial bearings exhibited on the house of a deceased person and later placed in church. Windows - as you come back down the south aisle look at the six windows depicting The Annunciations, The Adoration of the Shepherds, and The Presentation of Christ in the Temple. They are by Charles Eamer Kempe - one of the most important figures in the 19th Century church stained glass. South doorway - at the main south doorway you can see the oldest things. 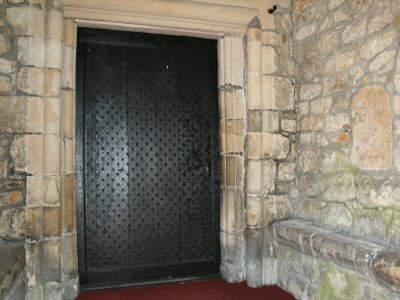 The stones of the doorway have been re-used but are probably early 13th century. On the inside, the headstone has unfinished dogtooth carving on the right only 4 1/4 teeth being completed. Oak door - the oak door itself has the date 1705 on the outside. There are 560 studs in this door, and if you look inside, you will see that most of them are square pegs in round holes. 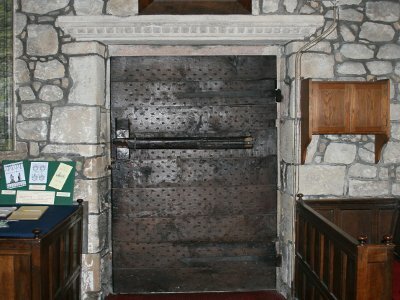 The door is still secured by a wooden bar which slots into the stonework. 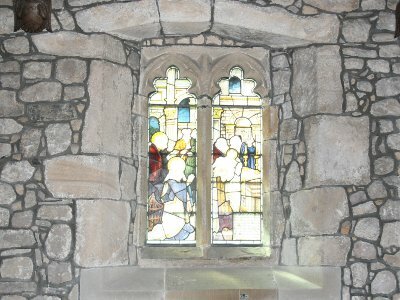 The west window at the end of the south aisle is a lancet window of the 13th century. There was a church here in 1190, but little is known about it. This 13th century work may belong to an early extension to that building. The tower - the tower has gone through at least two restorations in it's history - the last being 1994. It was built originally in the middle of the 15th century.The west side in particular is very handsome and finished in more sophisticated manner than most Craven church towers. It is supported to owe it's design to King Henry VI, who was sheltered at Bolton Hall by Sir Ralph Pudsay in 1464. The belfry - the belfry has a ring of six bells, the oldest three bearing Latin inscriptions.The first was given by Sir John Pudsay and has the inscription "St John the Baptist pray for the soul of John Pudsay Knight and Grace his consort"The second given by his son Henry bears the inscription "St Paul pray for the soul of Henry Pudsay and Margaret his consort".The third bell was given by Edward King early in the 19th century when he was Vice Chancellor of the Duchy of Lancaster. The inscription reads, "when I sound of tombs learn to die; when pulpits, learn to live". 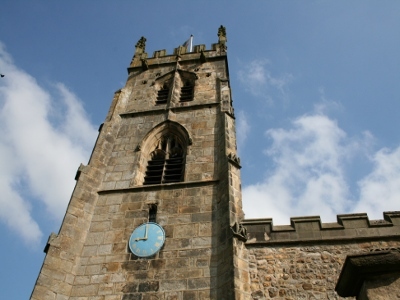 The bells were re-tuned and re-hung on metal frames in 1910.A fourth bell was added in 2003 in memory of Dr David Sutherland and the bell frames extended.The ring was completed in 2005 with the addition of a bell from a church in Manchester and with a new bell cast specially to complete the ring. It carries the inscription "to the past and future faithful"